Pre-Purchase On-Site Log Home Inspection: This is for the individual who may not be familiar with log home aspects. Our onsite inspection will not only educate the customer on the dos and don’ts of becoming a log home owner but also answer long term maintenance questions. You will receive an evaluation/estimate of the current condition of the structural components of the log building. Cost of pre purchase inspection is $375.00 and can be provided in a 7 day window period. Log Home repair and maintenance onsite Inspection: This is for the current home owners who’s homes may have been neglected over the years or are somehow needing repair. With this process you will be provided a written estimate on what your home requires to be up to date. Cost of maintenance and repair inspection is $125.00 which is refunded when a contract is in process with Performance Log Finishers. This can be provided in a 5 -10 day window period. Thermographic Log Home Inspection: This process is typically added to the above inspections. This can guarantee sound physical evidence of air loss in home. The Thermographic process can allow us to target specific areas of repair to save you on your overall sealing cost. (More information can be found under the thermographic tab) Cost of thermographic Inspection is $399.00 this information will be provided with above bids. Regular home/building inspectors are not always familiar with the finer points of log home construction. You need an experienced log home specialist to ensure your investment will stand the test of time. Log wall interior: Interior surfaces of log walls, should be examined for separation between logs, including light or air penetration from outdoors, separation between exterior log wall and interior partition walls and separation between log walls and interior ceilings. Windows: Log home windows including glass and frames should be examined and may need to be replaced during restoration. Doors: Most log homes have multiple doors. Due to the many times the doors are opened and closed over the years, the doors are often not in good working order and require repair during restoration. Air Leaks: Log homes can develop air leaks. Air-dried logs are about 15–20% water when homes are constructed. As logs dry over a period of years, the logs shrink and gaps may open, creating air leaks. Air leaks can be reduced if logs are dried for at least six months before construction starts. Many manufacturers kiln dry logs to prevent such problems. The best woods to use to avoid this problem, in order of effectiveness: Cedar, Spruce, Pine, Fir and Larch. Moisture in Log Homes: Tree cells can naturally absorb water, which can lead to wood rot and insect infestation. One way of controlling moisture is use of waterproofed and insecticide-treated logs and reapplication of such treatments every few years for the life of the house. Roof over-hangs, gutters, downspouts and drainage planes can also help prevent moisture damage. *Ask us about our thermographic inspections to identify air leaks, water leaks and potential areas of insect intrusion. This may be valuable for some with pre-purchase inspections. Log walls exterior: Exterior surfaces of walls should be examined for log rot and decay, overall appearance, presence of mold, mildew, fungus, cracks, discoloration, loose or missing caulking, adequate log sealants, separation of joints, condition of chinking, and condition of log ends. Roofs: Roofs should be examined to check for problems indicated by humps or valleys, roof material condition, flashing condition, and seals around chimneys and vents. Gutters, downspouts and fascia should also be examined. Wall Construction: The walls are made of logs that are notched at corners. Corner notching provides stability by locking the log ends in place and enabling the logs to fit together in a secure manner. Different types of corner notching include "saddle" notching and "V" notching or "steeple" notching, which get their name from the shape of the notch cut into the wood. Another commonly used technique, "square" notching, differs in that the logs are secured with the addition of pegs or spikes. Chinking: The spaces between logs are usually filled with a combination of materials in a process known as "chinking" and "daubing." This process seals the exterior walls, protecting them from weather and animal damage. Chimney: Many log homes feature fireplaces and chimneys that may sink or deteriorate over time. Site Condition: Signs of insects, grade and distance from structure, vegetation and soil. Log Home Type: Log homes can be made from handcrafted logs (logs that are individually fit together), or milled logs (machine-lathed logs). 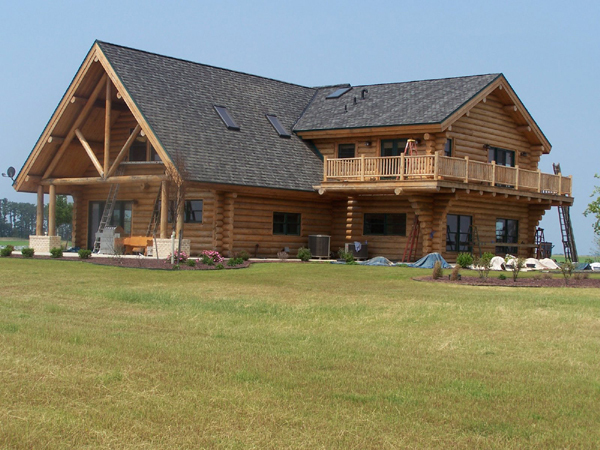 Some homes are insulated log homes, built with half-logs attached to a standard frame structure. Foundation: Log home foundation types include slab, block, and poured concrete and can include crawl spaces or full basements. Foundations should be examined for cracks and general condition.